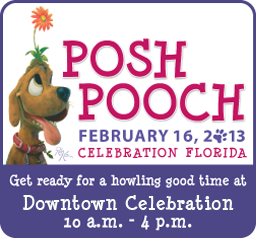 February 16, 10 a.m.-4 p.m.
Get ready for a howling good time at Posh Pooch in Celebration! Join us Downtown for a whole day of barking good fun. with the entire family (especially four-legged friends). Don’t have a dog? Looking for a friend for your dog? No worries! Saturdays, February 16 & March 9, 7:30 p.m. The Celebration Foundation is excited to once again bring back the Celebration Classical Concert Series. Featured concerts include the Florida Symphony Youth Orchestra, Orlando Philharmonic, and Mariangela Vacatello. Tickets are available at the Celebration Foundation, 610 Sycamore St. and Imagination Realty, 617 Celebration Ave.
For further information, visit the Celebration Foundation website. The deadline for filing is March 1st, 2013! You are currently browsing the Imagination Realty blog archives for January, 2013.